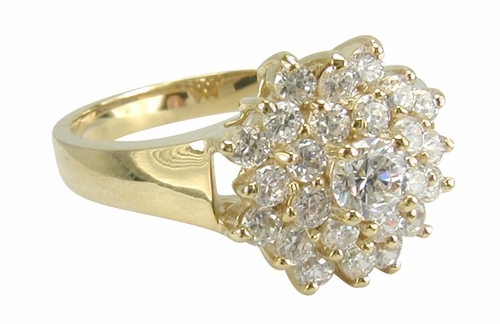 The Twinkle Round Cubic Zirconia Cluster Ring features a flower like arrangement of diamond quality cubic zirconia stones that shimmer and shine. A .38 carat 4.5mm basket set round center cubic zirconia is highlighted by a multitude of prong set rounds that vary in height for a slightly domed effect. 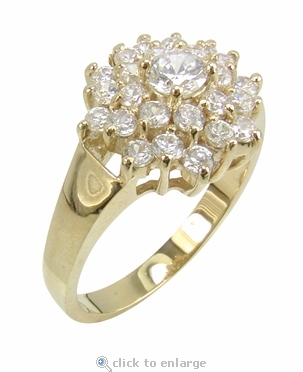 This cluster ring offers a lot of sparkle with its Russian formula cubic zirconia stones that are hand cut and hand polished to exact diamond specifications. This makes a great gift for a fun ring or it can also be worn as a right hand ring. 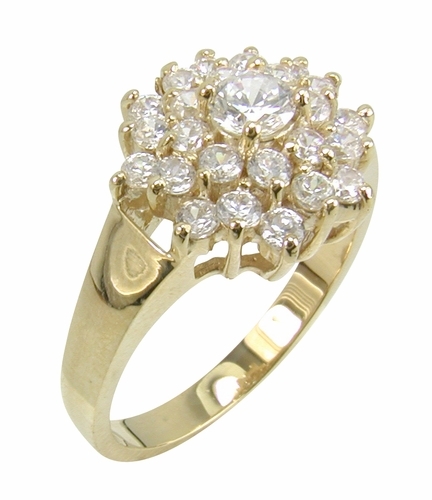 The Twinkle round cubic zirconia cluster ring has a total carat weight of approximately 2.25 carats and is available in solid 14k white gold and 14k yellow gold, see menu option for details. Due to extremely low pricing, all clearance sales are final.